KEBA has been developing and producing innovative and high-quality solutions for 50 years for the industrial, banking and service automation branches. 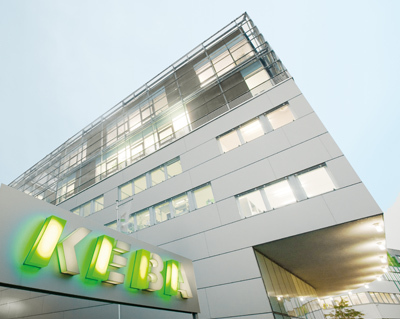 On account of the company’s innovative capabilities, it was natural that KEBA become involved with forward-looking topics such as energy automation and renewable energies. KeEnergy is one of the thereby created business areas that concentrates on heating controls for heat pumps and biomass boilers. With heating controls from KEBA with top hardware and software quality, you can get the most out of your heat pump or biomass heating system. We provide you with comprehensive support with your projects, regardless of whether you need a complete system or individual components. Complex technologies that were previously reserved for companies with large development departments are now available to smaller, medium-sized businesses. Intense and comprehensive support over the entire project life cycle is the basis for successful heating projects. Professional project management and high flexibility with prototypes shorten the time-to-market and guarantee maximum customer benefits and satisfaction during every phase of a project. Optimized complete systems for the respective target market are developed together with the customer in intense collaborations. The comprehensive understanding of the requirements, processes and markets down to the smallest detail has top priority at KEBA and forms the basis for a successful and long-lasting partnership. Various technology functions allow heaters to be set and used even more optimally. By means of speed control of heating circuit pumps and source pumps, further improvements in energy efficiency can be achieved. By evaluating the difference between the flow and return temperature, the pumps are always controlled exactly to the required flow rate. Pump power consumption is thereby reduced and the exact required flow rate made available hydraulically. As a result, the compressor can always be operated in the optimum operating range. The graphically depicted hydraulic schemes show the arrangement of the heating system with the various heating components. The hydraulic scheme for heating or cooling required for the given system and the corresponding description can simply be selected.